For those of you who thought your netbook was the ultimate portable PC... think again. 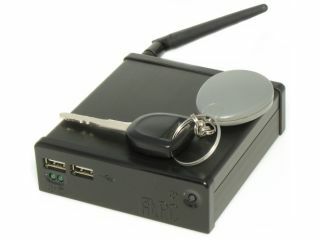 Fit-PC Slim is the world's smallest PC, coming in at the size of a car key, and offering some pretty high specs for its size. Measuring 110 x 100 x 30mm, it comes with a 500MHz AMD Geode LX800, Ethernet, VGA output, Wi-Fi, and a 2.5-inch hard drive option for those storage lovers. Using only 4-6 watts of power, this dinky little number could even be powered by solar panels. You can have either 256MB or 512MB of RAM, as well as VGA output and an optional Wi-Fi adaptor (LAN for those in love with the basics). Apparently, the Wi-Fi can either access a network or even be used as a wireless router itself, so making this a multi-option device. The Fit-PC Slim can be bought with 256MB RAM but no Wi-Fi or storage for $220, or a 512MB version with Wi-Fi for $245.